Sign up for a Snowflake trial and receive $400 worth of free usage without providing any billing information. You’ll receive $400 of Snowflake credit to use over 30-days. I signed up for a trial account but have not received my activation email. What should I do? After sign up, it may take up to five minutes to send your activation email. Please check your spam folder if it doesn’t arrive to your inbox. Otherwise, please contact support@snowflake.com and provide the contact name/email you used to sign up. *Note: Activation for the Snowflake produce edition, Enterprise for Sensitive Data, can take up to 24 hours. How do I add billing information? Click on the account tab, select billing and enter your credit card. Once I sign up, how do I cancel? 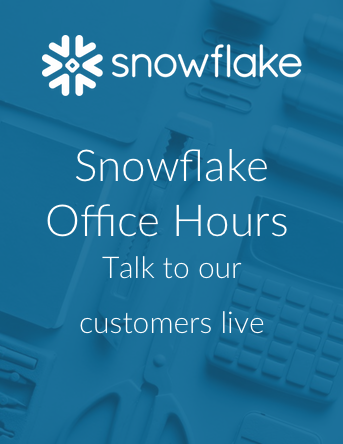 Once your account is approved, you can cancel at any time by contacting support@snowflake.com and providing your Snowflake account information. What happens to my account after my trial has ended ? Your account is subject to deactivation and your data may be deleted if you don’t add billing information within 30 days after your trial ends. How do I find my account link? Your account link can be found in your activation email. Be sure to bookmark this link. If you have any questions please fill out this form and we will get back to you as soon as possible.